Pattern welded and folded swords are similar but different techniques and produce quite different looking patterns in the steel..
Pattern welding was first developed by the Celts and later the Vikings out of necessity. Steel in this period was filled with impurities so they would minimize the chances of an impurity causing a catastrophic blade failure by twisting bars of steel together and hammering them out, then folding and repeating to evenly distribute the inherent impurities and minimize weak points. The end result was not only practical, but also quite beautiful, and was not lost on the Viking appreciation of aesthetics.. Folded blades are, just as the name suggests, simply a bar of steel that has been hammered out flat and folded a number of times - each folding doubling the number of layers and creating a distinctly different pattern in the steel. 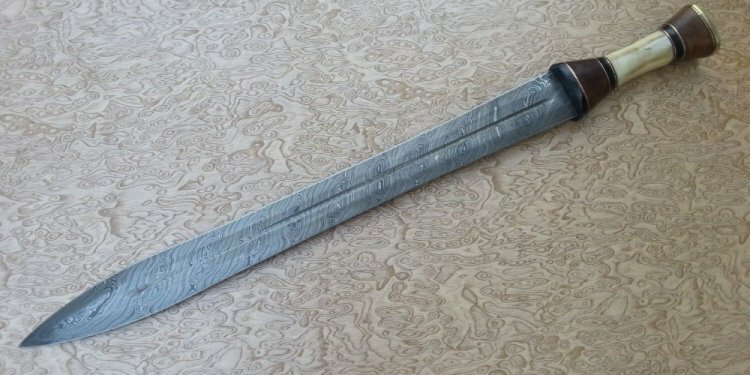 Most folded blades on the market are an attempt to replicate Tamahagane - the steel that traditional Japanese swords are made from..
Like with the Vikings, Japanese steel was extremely impure - and needed to be folded many times to try and even out the impurities. Unlike the Vikings, the actual Damascus pattern - the hada - was best appreciated if it was subtle and only visible upon close inspection.. The hada (folded steel) on this antique Nihonto is subtle. As all real Nihonto are..
For the sake of preserving this traditional craft, modern Japanese made Shinken (Japanese made Katana) are still made using Tamahagane, even though modern steel would produce a better result as it has virtually NO impurities..
And this is where most beginners go wrong, they fail to understand that - as far as functionality is concerned - folding a blade does NOTHING to improve its durability, cutting power or anything else even remotely useful. In fact, more often than not - it RUINS what would could otherwise be a truly functional sword.. The first problem with folded steel swords is that the process is effectively redundant. Modern steel HAS no impurities to speak of, so there are no impurities to even out.. But the biggest problem is that the vast majority of folded steel blades today are mass produced by apprentice sword smiths who really could not care less if it has bad welds, air pockets, overly large grain sizes or carbon differentials..
What this means is that the sword is more often than not, severely compromised by folding, and may tear, break or crack at any of the numerous weak points that poor folding practices creates..